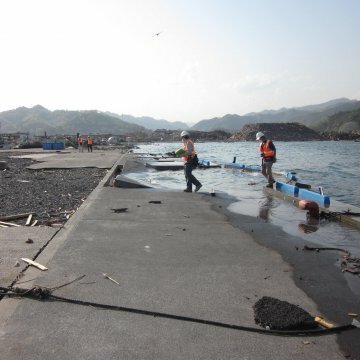 The third and fourth disaster assessment teams assembled by the American Society of Civil Engineers (ASCE) deployed for Japan today to study the effects of the March 11, 2011, 9.0 magnitude earthquake and the resulting tsunami, which wrought massive destruction along that nation’s Pacific coastline. The tsunami inundated approximately 292 square miles, or 470 square kilometers. One of the teams has been charged with examining the tsunami and earthquake effects on port structures. While loss of equipment and cargo at the ports is visible from satellite images, some of the port structures do not appear to have suffered damage. The team will take an up-close look into the design and construction of these structures. The other team will look into the impact the earthquake and tsunami had on coastal engineering structures such as tsunami walls, breakwaters, seawalls–coastal engineering structures that are used for navigation, flood control and life safety. ASCE serves the civil engineering profession as an essential source of technical guidance in the United States. The Society is responsible for the ASCE 7 Standard, which governs the Minimum Design Loads (weight) for Buildings and Other Structures. Currently, all coastal flood minimum design standards for buildings and other structures are based on hurricane conditions, and these have never been evaluated for tsunami wave conditions. According to the Oregon Department of Geology and Mineral Industries, the Japan event is virtually a mirror image of what might occur when the next major earthquake occurs on the Cascadia Subduction Zone off the U.S. West Coast. A tsunami inundation of the Washington, Oregon and northern California coastlines could occur within 15 minutes of such an earthquake. There is a population of 13 million west of the Cascade Range. Because of the industrialized and densely populated nature of the Honshu Tohoku coastline, and the similarity between Japanese and U.S. building codes, lessons from this tsunami will be immediately relevant to the U.S. West Coast, Alaska, Hawaii, and Canada. View Their Work: Each ASCE disaster assessment team is detailing their findings in a daily online “diary” posted on the ASCE Web site. Each diary includes powerful photography from the scene. Follow their daily investigations here. Members of the Port Structure Team include: Marc Percher, Halcrow, Inc., Oakland; Alex Augustin, California State Lands Commission, Long Beach; Bill Bruin, Halcrow, Oakland; Martin Eskijian, California State Land Commission, Long Beach; William Rudolph, ENGEO, San Ramon, Cal., and Yoshi Oritatsu, Liftech Consultants, Oakland. Members of the Coastal Structures Team include: Lesley Ewing, Sr. Coastal Engineer, California Coastal Commissioner, San Francisco; James Marino, Director of Engineering, Coastal Technology Corp., Debary, Florida; Ronald Noble, Noble Consultants, Inc., Ignacio, Calif., Bryan Jones, Regional Director/Chief Project Manager, Ocean and Coastal Consultants of COWI, Plymouth, Mass, and Catherine Petroff, LP4 Associates LLC, Affiliate Researcher, UW, Seatttle. As part of its disaster response procedure, ASCE forms technical teams to study infrastructure damage caused by natural or man-made disasters. Such studies are conducted so that engineers may learn from the disasters, and so those lessons learned may be documented to inform future actions, including revisions of technical standards. ASCE has participated in more than a dozen disaster assessments in the last decade, including studies of the World Trade Center and Pentagon following the attacks in 2001; assessments following hurricanes Katrina and Ike in 2005; tsunami assessment throughout the Indian Ocean Basin in 2004, and earthquake assessments in China, Peru, Japan, Sumatra-Andaman, Alaska, California, Italy, Algeria, Turkey, Haiti and Chile.